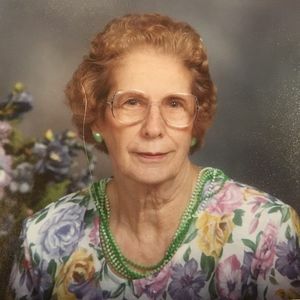 Bette J. O'Brien, 96, of McHenry, died comfortably on March 10th, 2019, at Valley Hi Nursing Home in Woodstock. Born January 21, 1923, in McHenry, she is predeceased by her husband, William J. O'Brien and her brother Bernard (Bernie) Buss. Bette was a selfless mother and homemaker, raising six children while working as a bookkeeper/accountant for various local businesses in McHenry, and as a secretary at Marian Central Catholic High School in Woodstock. She was a devoted member of St. Mary's Catholic Church in McHenry and later Resurrection Catholic Church in Woodstock. She enjoyed jigsaw puzzles and was very active with the FISH charitable organization, an avid bowler, card player, and Chicago Cubs fan! Survivors include her six children, Kathleen (Kitty) O'Brien of McHenry, Illinois, Susan (James) Cervantes of Jacksonville FL, John (Carol) O'Brien of Chalfont, PA, James (Mary) O'Brien of Woodstock, IL, Denis (Georgia) O'Brien of Woodstock, IL, and Daniel (Meg) O'Brien of Rock Falls, IL. She is survived also by her brother Edward (Joan) Buss of McHenry, IL and sisters Mary Reynolds of Burlington, WI, and Ella Jean Buss of East Lansing, MI. She is further survived by 13 grandchildren and 18 great grandchildren. Add your thoughts, prayers or a condolence to Bette's guestbook.